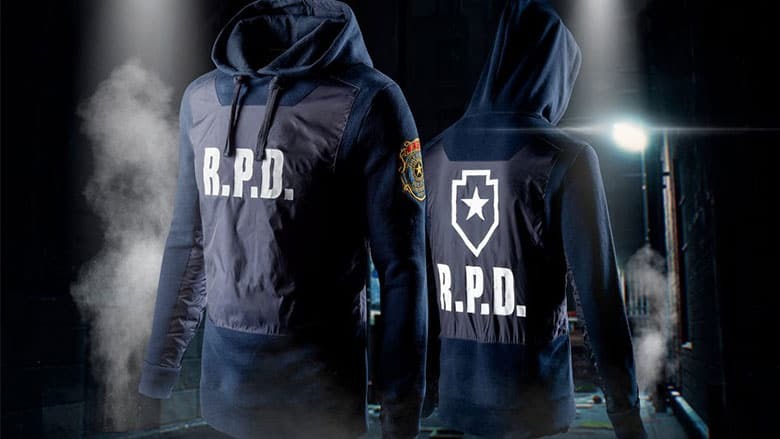 Resident Evil 2 RPD Hoodie | Nerd Much? This Resident Evil 2: Leon Kennedy RPD Premium Hoodie is an excellent choice for any fan of Resident Evil. Originally released on the Sony PlayStation in 1998, Resident Evil 2 was the second game in the long-lasting survival horror franchise that has recently released a technically impressive update of the original game. With the recent release of the Resident Evil 2 Remake, every fan wants a zombie-bite of whatever Resident Evil swag that they can get an undead hand on. Thankfully, at only $69.99, this premium hoodie on offer at Merchoid won’t leave you feeling low on life and in need of some health herbs. Best of all, this is genuine Capcom merchandise, so you know you’re getting a quality hoodie. The hoodie is based on Leon Kennedy’s RPD police outfit and features dual materials to simulate the vest on Leon’s outfit. The hoodie comes in a dark royal blue, while the RPD vest is a darker blue-grey. The vest features the iconic RPD letters and star and shield on the back of the hoodie in bright white detail. Even more impressive, the right sleeve features an embroidered RPD shield with all the detail you would expect for Racoon City’s finest. This includes the founding of the department in 1969. How is that for attention to detail? The drawstrings on the hoodie are particularly wide as well, for easy grip when it starts raining zombie parts all over the city. The Resident Evil 2: Leon Kennedy RPD Premium Hoodie is currently available for pre-order from Merchoid.com. You’ll have a generous 100-day return policy though, according to Merchoid, but it probably doesn’t work if the hoodie is stained in Licker guts. The Resident Evil 2: Leon Kennedy RPD Premium Hoodie does not come with a free typewriter to save your progress, sadly. Want more zombie-themed stuff? Check out our mega hub containing over 50 of the best zombie gifts you can buy right now.